montanan, Mike VE2TRV, fordy744 and 16 others like this. @r_i_straw -- diggin the BL-2!! Dogwood, montanan, Mike VE2TRV and 15 others like this. Russell, what is the Boston & Maine doing out in Texas? Good morning from cloudy, mild and rainy Northeast Ohio! I managed to get a couple of cars done this week. This is a Walthers 4427 CF PS Covered Hopper kit, substituting for a Bethelem Steel 4526 CF Car as we will get multiple vendors for the 4427 but no Bethelem car ever made. This is the first cars the Ann Arbor got after the DT&I took over the Ann Arbor from the Wabash, which had to divest the Ann Arbor due to the merger with the NKP and NW. The first use of the compass herald on the Annie. They were used in moving malt to breweries in Wisconsin via the car ferries. A long involved story goes with this car. In 1972 the DT&I managed to get a new sand pit opened in Yuma, MI with them loading 20 cars a day for shipment to the Brook Park, OH Ford Engine casting plant. The DT&I supplied 100 - 100T PS 2600CF Covered Hoppers for this service to go with the Annie's existing 1958CF Covered Hoppers. After the DT&I divested themselves of the Annie after Conrail as they did not want to be involved with CR or any other railroad at the time, the Annie had to replace the 100 DT&I cars, so they leased some 77 Ton cars from Chicago Freight and 125 77 Ton ACF CH-29 Cars from the P&LE. This car is from an Eastern Car Work's pseudo CH-29 kit, but the lettering was a real problem. NYC fans will notice the capy and other lettering is from the NYC which I found on a Microscale P&LE set, the ferry in the fog came from the Herald King Caboose set and some from the 50' Boxcar letttering with the return to Yuma, MI lettering coming from a Highball Graphics DT&I set. Another neat thing was after Conrail and their loco shortage sometimes Ann Arbor power was used all the way to Brook Park. gjslsffan, Mike VE2TRV, fordy744 and 14 others like this. Two Santa Fe Geeps (one with "torpedoes" for passenger service) pull a heavyweight consist through Hannah Vista. montanan, Mike VE2TRV, fordy744 and 15 others like this. Hmm. Seems to be a little far from home, but love it nonetheless. It was the BL2 that caused me to actually recognize the existence of diesels. Nice! A couple of cars that reflect (both literally and figuratively) the colorful history of the Ann Arbor. Just one of my early railroad interests. My family spent four years while I was growing up living in New Hampshire. A B&M branch line ran along the hillside across the street from our house in Milford. Mostly RS3s and sometimes an F unit would haul short trains along it from Nashua to Wilton. I don't think they liked the Fs because they had to wye them in Wilton on some pretty sketchy track. montanan, Mike VE2TRV, dti406 and 10 others like this. A few loads of cracker catalyst and she won't be so clean. montanan, Mike VE2TRV, fordy744 and 13 others like this. RailMix, gjslsffan, BoxcabE50 and 7 others like this. Here's my 2 cents. 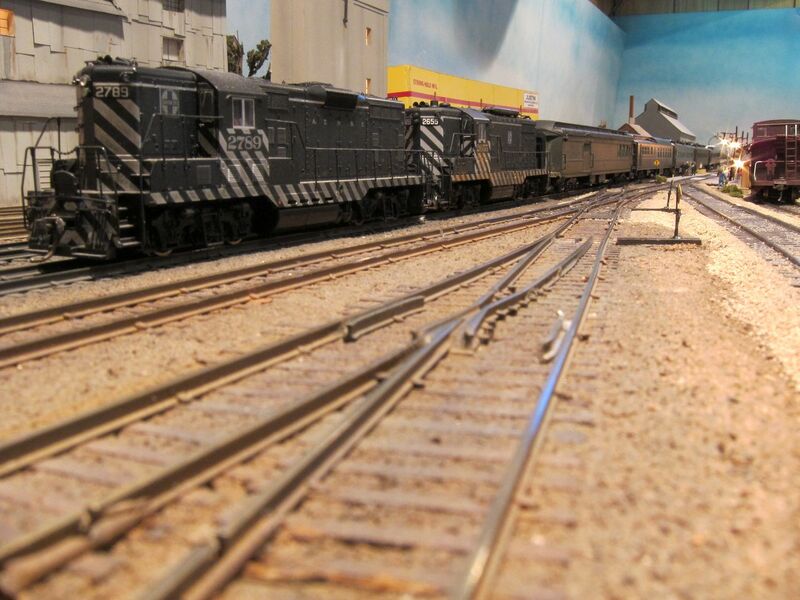 A local switcher descending the grade to drop off a few cars at one of the yards on the layout. Carl Sowell, SecretWeapon, RailMix and 6 others like this. Worth a lot more the two cents!